I have a collection of bones at home, a few of which are on display, including this sheep skull with its barbed wire crown. The text translates as “…your poetic essence is still in the neighbourhood…” and is dedicated to a lovely chap from Vejer who lived just round the corner from me and who recently died. I didn’t know he was ill. If I had known that his presence was not a ‘for granted’ thing I would have made time to stop and chat over a coffee more often. His observations were cheery, wise and gentle…his poetry is timelessly mysterious and beautiful. Encantada de haberte conocido José Luis. 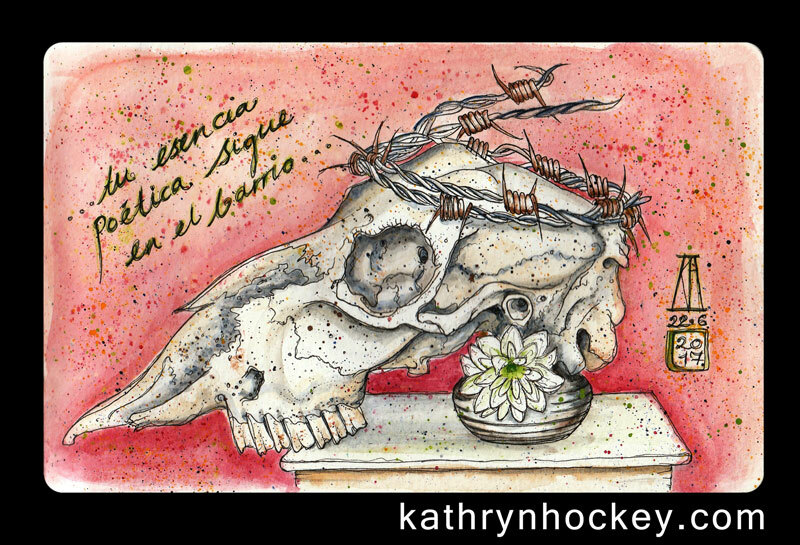 This entry was posted in sketches and tagged acuarela, barbed wire, death, flower, illustration, pen and watercolour, sheep, sketch, skull, still life, tribute, water color, watercolour by kathrynhockey. Bookmark the permalink.